Free activity calendar for kids. Keep the kids busy all November long with these awesome activities and crafts for kids! Last month, I shared 31 activities and crafts to keep the kids busy all October long and apparently, you loved it! 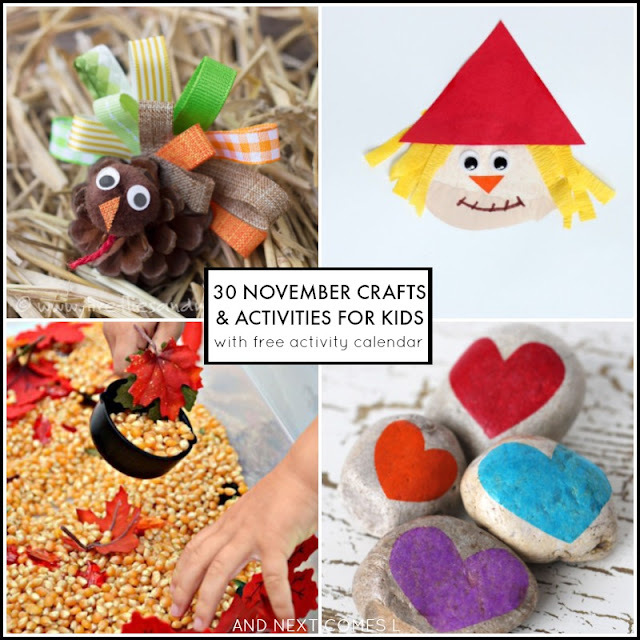 So I'm back sharing 30 awesome activities and crafts for kids for the month of November. This free activity calendar includes lots of fall crafts, Thanksgiving crafts (for the American readers - as I know Thanksgiving is long gone here in Canada), and some winter crafts. There's one activity or craft per day and there are even a free printables for some of the activities. Your kids certainly won't be bored! 3. Weaving with Feathers from Fun-A-Day! 11. Colorful Corn Mosaics Process Art from Fun-A-Day! 27. Counting Snowballs from Fun-A-Day! 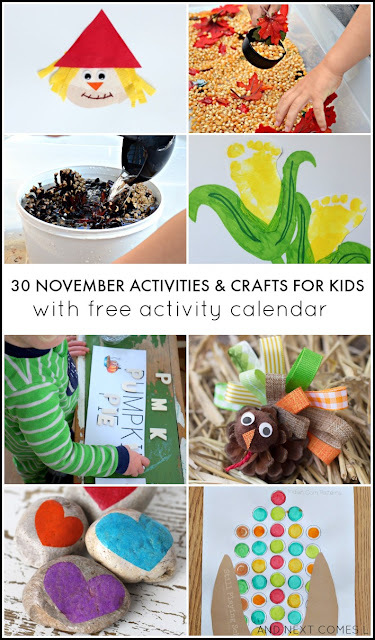 These 30 crafts and activities can be found on this free activity calendar for kids. Download your copy below and keep it handy on your phone or computer. Then every morning, simply open the calendar, find the current date, and click on the corresponding photo. You will be taken to the activity's or craft's instructions. No need to plan activities for your kids as this calendar has it all: math, science, crafts, fine motor activities, and more! To download the calendar, either click on the image below or click the link below the image.